A man walks past closed restaurant during a blackout in Caracas, Venezuela, March 26, 2019. 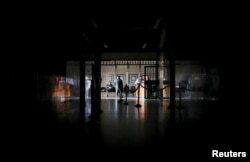 President Nicolas Maduro's Socialist government, which blamed the United States and the opposition for the previous power cut, said an "attack" on its electrical system caused the blackout that first hit on Monday. 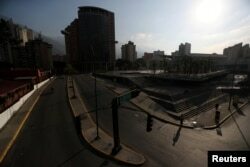 The outage shuttered businesses, paralyzed the country's main oil export terminal, and stranded commuters. "If the blackout lasts two days down here, it'll last five up there," said Maria Ojeda, 20, who works at a piñata shop in Caracas. "I'm going home because there's no work, there's nothing going on." Commercial area is pictured during a blackout in Caracas, Venezuela, March 26, 2019. Rodriguez did not explicitly blame Monday's outage on any particular individual or group. But he said, "the intention of Venezuela's far right is to attack, generate anxiety and anguish, in order to seize power and steal all our resources." People sit during a blackout in Caracas, Venezuela, March 25, 2019.